At this time, the word “agile” is often associated with software development. Many web sites and resources about agility have this focus (see www.agilealliance.org). However, the concepts and practices that are focused on software (see www.agilemanifesto.org, www.extremeprogramming.org, www.controlchaos.com), are also in use to various degrees under various names in other fields: Lean Manufacturing, Just-in-Time Logistics, The Scientific Method, Creative Problems Solving, and Organizational Learning, among others. Agile Advice and it’s sister web site (AgileMasters.com) aim to bring the notion of agility to all types of work: Agile Work. The Agile Advice blog is meant to be an attractive resource for people exploring the use of agile principles and practices in all aspects of work, community and personal life. Agile coaches, consultants, practitioners, trainers, novices and any other interested people are all invited to participate by submitting suggestions for topics to topics@agileadvice.com. 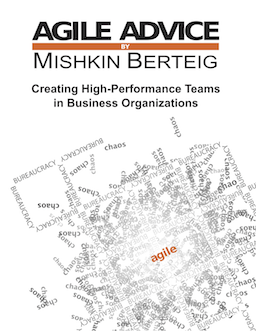 Agile Advice aims to be practical, useful, and relevant on one hand, and exploratory, thought-provoking, and ground-breaking on the other hand. With that in mind, entries in the Agile Advice blog will fall under five categories: Agile Work Practice, Agile Work Theory, Agile Work Stories, Interesting Stuff, and Announcements. We will also be open to any suggestions, criticisms, or questions about the work we do here. Please feel free to contact us at comments@agileadvice.com.